One call does it all. 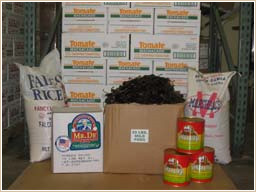 We have a full line of canned goods, spices and groceries to meet all your menu requirements. Browse the list of our Grocery Items included below. If you don’t see what you’re looking for just give us a call, we’ll know where to get it for you! Please continue to scroll down to view the complete list of all our available grocery items.